If you have always wondered how people whistle with a blade of grass, you're in luck. You can learn how to make a whistle from grass by following these instructions. So pay a visit to your lawn and pick up a piece of grass, and practice making a whistle today. Select a thick and wide piece of grass. Some varieties of lawn grass are better than others for this purpose. 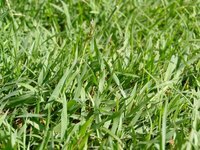 If you have access to several different kinds of grass, you should select a blade that is at least 6 inches long, fairly thick both in width and rigidity. The length is important so that you can adjust the tension on the blade. The thickness is important because the grass will be like a reed from a musical instrument. You might want to pick several blades of grass and experiment with different ones, since each one will whistle at a different pitch. Rinse the grass thoroughly to remove any dirt or possible pet urine. You can use dish soap if it makes you feel better. Pat it dry or blot with a paper towel to remove any residual moisture. Press the bottom of the blade of grass in between the base of your thumbs. Use your fingertips to pull the blade of grass tightly to form a reed, similar to that of a musical instrument. Hold the blade of grass between the top and bottom part of your thumbs and make a mental note of the hole around the blade of grass. Blow through that hole to make a whistle. You can adjust the pitch of the whistle by opening and closing the hole. Dry grass is better to use than wet grass. Do not whistle with grass that has been exposed to pesticides, fertilizers or herbicides.